The Sizzlers were a 1970s Hot Wheels spin off with a built-in motor and a tiny rechargeable battery. (The X-V racers of the 90s were similar.) They were introduced in 1970 and became an instant smash. Sizzlers run on the regular “orange” Hot Wheels track, and Mattel created special race sets with U-Turns, multi-level spirals and loops to take advantage of the cars’ electric motor. Two lane race sets such as the California/8 race set were developed that allowed Sizzlers to race side-by side, until Mattel created the black Fat Track, which is three lanes wide, with steep banked curves, and designed to allow Sizzlers to run free. In action, Sizzlers display a unique, competitive “passing action” when running on the Fat Track, as if each car were piloted by an impatient driver trying to jockey ahead of the rest. The Fat Track sets included the “Big O”, “California 500″, and Super Circuit” race sets, and accessories such as the “Scramble Start” (a four-car starting gate), “Lap Computer” four car lap counter, and “Race-Timer” stop watch. Six cars were made in 1970, 12 cars were made in 1971, and 4 cars were made in 1972. The “Fat Daddy” Sizzlers (oversized bodies with huge tires) were introduced in 1973. 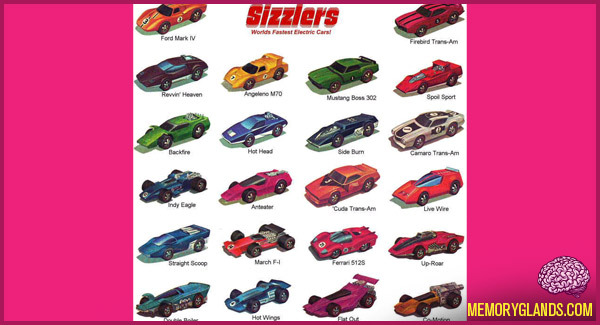 Mattel put the Sizzlers on a hiatus after that year, and in 1976 they created Sizzlers II. That next year, the Night Ridin’ Sizzlers (which had headlights you could turn on or off) were created. Because of faded popularity (because of perhaps poor marketing, Mattel permanently stopped Sizzlers production in 1978.